I have had several questions about my photography and the type of camera that I use. So I thought I'd take a minute to share my love of photography with you all. I caught the photography bug from the Hubby. But even though he has run his photography business for the last 7 years or so, it was just recently that I have nudged him into the world of digital photography (he is warming up to it, although he definitely still prefers film). As I have helped him in his business, I have really grown to love the art of photography. I wanted to join him photographing weddings and such (I got to be 2nd camera with him for the first time at a wedding this summer!) but I told him that I really needed immediate feedback on my photography so I talked him into buying a digital camera. I asked for a Nikon D40, but I let him go buy the camera, so he came back with a Nikon D60. I LOVE IT! We still have not invested in any fancy photo-editing software, however. I mostly use the software that came with the camera. But recently I discovered a great website where you can edit photos...http://www.picnik.com/. It's a lot of fun! 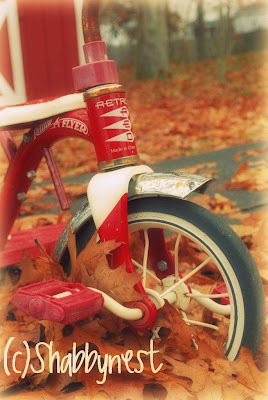 I got a lot of compliments on my photo of Two's tricycle last week but I hadn't done anything with it aside from adjusting the light a little, so I decided to see what I could do with it on Picnik. I like it! What do you all think? If you like photography, go check it out and have a little fun! Oh, and before I forget...thank you Julie for this award! 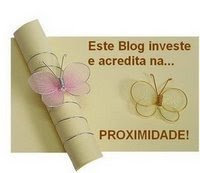 First of all I love your blog! I really like the picture with the tricycle too. The editing looks great. I am going to go check out that site. Thanks for always sharing so much great stuff. I agree that fancy photo editing software isn't required these days, especially for blog-posting, but it surely is addicting! Your pictures are always beautiful, crisp and clear. I was wondering what kind of camera you used so thanks for answering that question. I love, love, love photography & don't have any editing software (yet) so I'll surf on over & check it out. I also need to know how to do that cute little watermark thingy. Hi Duchess! Like I said, I don't have any fancy photo editing software so I have been using Microsoft Paint to put the watermark on. The only thing I don't like is the fact that I can't make it more transparent. But it's really simple...just open the photo you want to work with. Then use the text tool. It gives you an option of whether you want to see what's behind the text or not. Of course, you want to see what's behind so click that box. Place your text box, choose the color you want the text to be, and type. I probably made it sound complicated, but it's really easy. Hope this helps. Thanks for the information. I've been looking to update my camera and will take a look at this one. My brother is studying to be a photographer and he also likes film better. I'm too impatient so I must have digital. Wendy the photo looks great! I'm asking santa for a new digital camera. I am like your hubby I still love my film camera also. I'm asking for a Nikon D40 for Christmas. I'm hoping it goes on sale at least a little bit. :) Your pictures are always great! I have the same camera and love it. I know nothing about photography other than the fact that I LOVE taking pictures. I have a friend who I've been begging to teach me all about ISO, apeture, shutter speed, and everything else. Your pictures are great! I will definitely check out that website. Thanks for sharing! Oh Great One,...Will ya please just come and give me lessons??!! That's a great site. And your pixs always look so good! That picture looks awesome! I'll have to check out that site. I love it...I love to dabble with my pictures..I will check it out! Thank you so much for always sharing great ideas and websites you come across. So appreciated. Also, I love your new feature, Friendly Homes... What a treat! And last, but not least, your daughter's banner turned out adorable. I will show this to my two young mommies. Great idea! I will definitely check out piknik. I have some basic photo editing software on my computer but nothing fancy...looks like there's more that can be done online! I love it!!! The picture looks so old fashioned and homey and perfect!! Thanks for the scoop, but I think the talent has a lot to do with it! I am so envious. I wish I could take quality pics. I am horrible.